Newspaper and online reports today put the heat on President Goodluck Jonathan for allegedly soliciting and receiving a church building gift from Italian construction company, Gitto Construzioni Generali Nigeria Limited (GCG), a federal government contractor. The reports indicate that, during the dedication of the church, the president had said it was donated to him in fulfillment of a promise made by the managing director. In the wake of the furious criticism following the reports, an anti-corruption group,Socio-Economic Rights and Accountability Project (SERAP) has petitioned the Economic and Financial Crimes Commission to probe the “gift”, given to the president at his native Otuoke in Bayelsa. According to SERAP, in its petition dated yesterday,, the ‘gift’ which is a 2,500-seat church building is cause for worry. 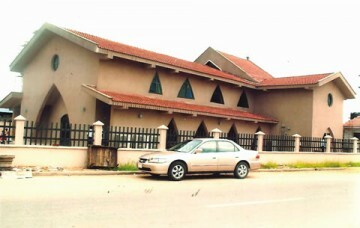 “We are seriously concerned that given the huge sum of money involved and the timing of the church building ‘gift’, the acts may amount to a bribe to the government by a construction company that has sought and obtained huge contracts from the federal government,” the statement signed by Adetokunbo Mumuni reads. “Procurement and investment agreements corrupted by this kind of ‘gift’ invariably lead to increased costs not only in higher prices but also in needlessly expanded and ultimately inefficient projects. Other critics of the action include lawyers Femi Falana and Prof Itse Sagay, former governor Balarabe Musa as well as the Congress for Progressive Change and the Campaign for Democracy. According to Falana, “It is illegal under the Constitution and the Code of Conduct, which say no public officer can even take a national honour while in office.They must also not take or collect any gift, except gifts such as kola nuts.What Jonathan has done is an impeachable offence. The contractor’s aim was to bribe him, which the President has fallen into. Accusing former president Olusegun Obasanjo of the same offence with his presidential library, he said the church has to be forfeited to the government under provisions of the Code of Conduct Tribunal Act and Bureau. In a pushback against the story, there have been reports that, contrary to the purported gift, there are facts to show that Gitto was contacted by the community to renovate the worship centre. The counter-reports also claim that, during the burial of the president’s father, the officiating minister had asked Dr. Jonathan’s “friends to come to the aid of the church and assist in renovating its aging facilities”. A bunch of timewasters, when did Anglican Church buildings now become personal property of anyone ? This is a simple matter na…"The construction of the church building is part of the Company's Corporate Social Responsibility in making sure that the people of Otuoke have a befitting place of worship"…Shikena.